Like I said, I'm really into farro right now and just to prove it to you I've made yet another dish at home that consists of farro, or to put it more precisely, farro was added to it. The back story to this dish is... for those of you who don't know I've recently had a baby, he is now 5 months old and I have decided to stop breastfeeding which has proven to be a lot harder than I imagined. 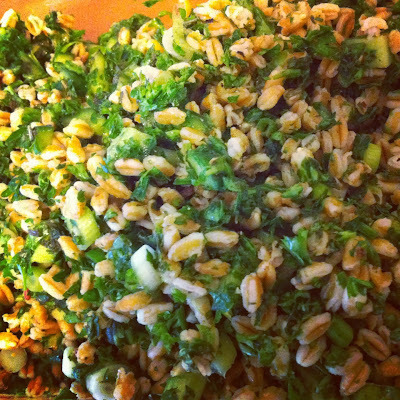 There are many foods one can eat in order to increase breastmilk and there is also many foods one can eat to decrease breastmilk, parsley and mint just happens to be two herbs that decrease breastmilk, so I figure I'd make a boat load of toubouleh and... eat it all. The dish is refreshing to the palate and simple to make, a perfect side for kabobs or grilled fish. Make 1 cup of farro as directed on the package. I used Trader Joe's 10 Minute Quick Cooking Farro. Once the farro is cooked, drain then toss with the lemon juice, 1 teaspoon of salt, as much or as little pepper as you'd like and the olive oil. Add the parsley, mint, scallions and cucumbers and toss to together. Add more olive oil, salt and pepper if needed. Allowing the dish to sit for a few hours in the refrigerator will allow the flavors to marry, it does make quite a difference. I live in LA & spend way too much time fulfilling my gastro needs. I love to eat and with good company. Always remember the dining experience is not just about eating but the atmosphere, company and conversation too. One of my goals for 2013 is to eat out less AND to cook at home more by spicing up my kitchen life, this means cooking foods that I don't usually. Oh this will be fun!